I have mixed emotions about the All-New Ultimates. 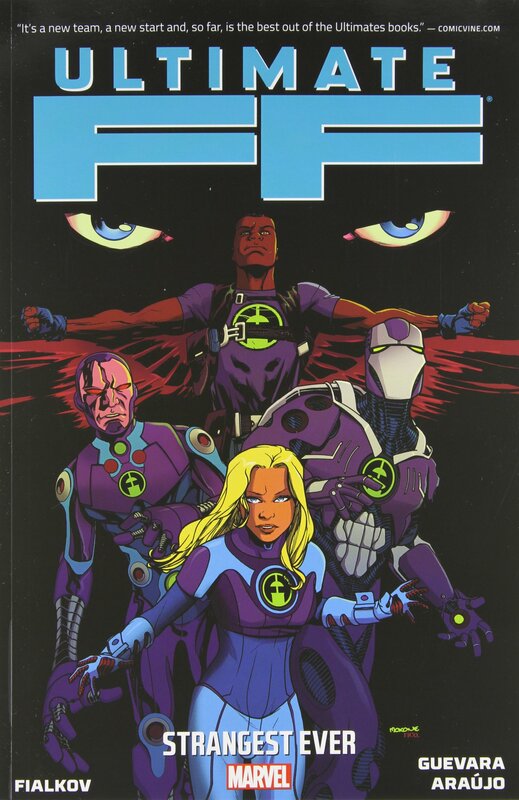 For one thing, well, there just aren’t a ton of familiar characters left alive in the Ultimate universe, and most of the ones that are left moved on to the Future Foundation. 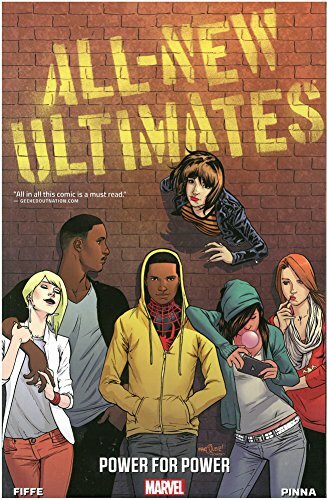 It’s not that I don’t want to see Spidey and his Amazing Friends battle street crime, it’s that it seems silly to shoehorn them into the Ultimates, just so that team is still “alive”. Same plot, different title? I’d… well, I’d still have some complaints. Because, all of that said: I’m not sure I saw the point of Spidey and his Amazing Friends the Ultimates taking on street level crime in the first place. I mean, okay, the gangs seem to have powers, at least a little? And there are leftover renegade scientists from the Oscorp and Roxxon days finding new ways to screw people up. So on paper (heh), it’s a reasonable conflict. But: the Serpent Squad? Really? Which is me complaining about how the villain side of the equation is just as depleted as the hero side. That’s a structural complaint, but I also have a related plot complaint, which is that it seems like I should have heard of any of these gangs before, if they’re supposed to be a big deal now. But then, all of that is balanced by the team’s make-up. Spider Woman, newly christened as Black Widow, is the leader. Then there’s Spider-Man, Bombshell, Kitty Pryde, and Cloak and Dagger. 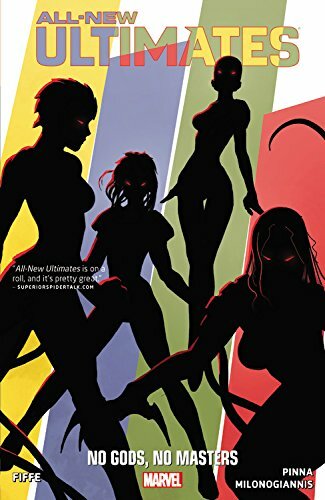 You’ve heard of maybe half of those, which is why my point is not coming across, which is that the Ultimates is comprised of four ladies and two dudes, neither of whom are white. Get these people some actual villains and storylines, and I could find myself very excited by what Marvel is doing right now. Also, just give Jessica Drew (that is, new Black Widow) her own title, already. This entry was posted in Words and tagged graphic novel, Marvel, superheroes, Ultimate Series on December 11, 2014 by Chris. 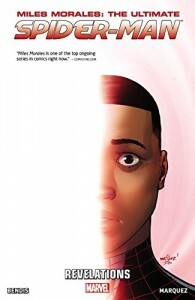 Without this Cataclysm event coming up, I could see myself being extremely excited about the direction in which Bendis is taking Miles Morales’ story. …okay, that’s not fair. I still am excited about it, I just hate to see it get put on hold for a big giant event that he should by rights be at the fringes of (I mean, unless the earth is destroyed? That would change my opinion drastically and unpredictably), or even worse, get partially canceled / re-written. Perhaps what I am saying is, I wish Bendis was at the helm of the whole universe, so I could trust that this particular aspect won’t get railroaded somewhere dumb. Stan Lee originally wrote this story (well, title) for issue 50 of Peter Parker’s run, published in 1967. Pete was tired of being Spider-Man because his life was always one terrible event after another, and something something Aunt May’s heart, and long story short, Marvel could not go more than 1/3 of the pages in any given comic without the hero being in costume, so you knew something would change his mind by early in issue 51. (In this case: Kingpin.) Bendis’ take on Spider-Man No More! is interesting to me for quite a few reasons, but chiefly because of the vast gulf of difference between Then and Now. 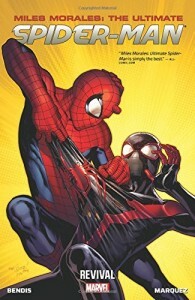 Miles went through a fairly major life event at the end of the previous book, as a result of which he’s put away the uniform and the web slingers to resume a normal high school life. And then, boom, a year passes. A year! Because Miles, unlike non-Ultimate Peter Parker, knows how to commit to a decision. Of course, it’s still a comic and the past always catches up with you, but unlike Stan Lee (however much I appreciate all that he’s done), this was handled thoughtfully, with false starts and denials before the inevitable outcome, and I do not feel that Miles is on a whiny pogo stick. I definitely think, as I already said back in that top paragraph, that he and Spider-Woman are on an excellent path with a lot of potential, and I hope I get to see how that turns out. I bet you could see this coming. This entry was posted in Words and tagged graphic novel, Marvel, superheroes, Ultimate Series on March 26, 2014 by Chris. I’m very nearly caught up on Ultimate Marvel comics again, after my year-long hiatus to read about a shepherd with a sword. Which is really good timing, because The Ultimates: Disassembled makes a good go at tying up every loose end that has dangled since the Ultimatum, not to mention a few from the Gah Lak Tus incursion. 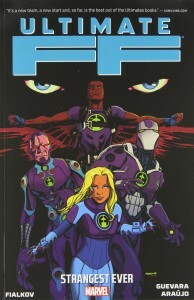 Plus, the Fantastic Four are finally reunited?! Unfortunately, it cleans up those loose ends in such a way that I’m still not sure if what’s been going on with Quicksilver for the past three years or so has all been this, or different authors pulling him in different directions. (See, I was going to say, “If you want to know what’s been up with Quicksilver, here you go!” Only, I’m still not completely positive I do know.) 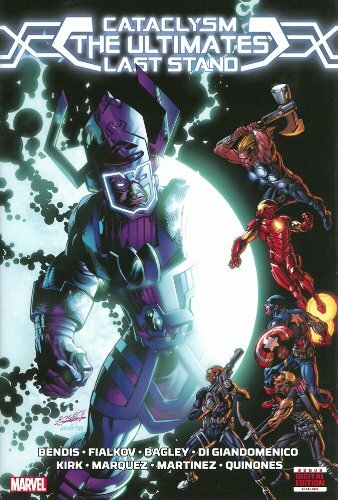 If you want to see another convoluted time travel story involving Kang the Conqueror? Cool, here it is! If you care about the Infinity Gauntlet, this is where you’d find the Ultimate version! What is fortunate is that this felt like a story instead of the series of tickboxes I complained about for the last Ultimates outing. An exciting story, with more than a dollop of consequences, and a big albeit possibly premature glimpse at the upcoming, what are they calling it this time, Cataclysm I think? I’ll definitely take that. 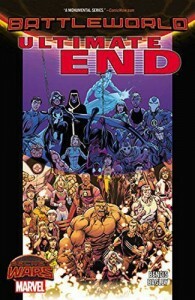 But I am kind of sad at implications that my excellent character analysis of Ultimate Reed Richards (available upon request in comments, if I haven’t already told you it in some other written or aural format) may have just been undone. Thanks a lot, Kang. If there’s one thing that does make me happy about there being a new massive crossover event that will kill off half the populace or more all over again, it’s that I can at least start referring back to a new dividing line between “then” and “now”. Plausibly, I will someday care about this. This entry was posted in Words and tagged graphic novel, Marvel, superheroes, Ultimate Series on March 4, 2014 by Chris.